Shasta Design offers two power pulleys, depending upon application. 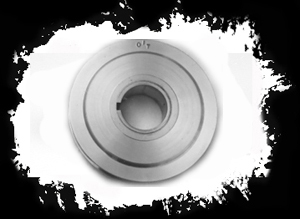 The first identical to the stock Porsche pulley of 5.75 inches in diameter. The second is 5.0 inches in diameter and is tailored for the slalom, time trial or vintage racer, who will be shifting around 7,000 rpm. down enough to prevent cavitation, where the fan is turning too fast and actually "chokes up" and delivers less cooling air. Both pulleys are made from 7076-T6 aluminum and hard anodized to prevent the seal from cutting into the aluminum.